In the past month I’ve been working with managers and directors from a large firm of accountants on how they use online networking to win clients. Naturally this has involved a deep dive into LinkedIn and how they use this ‘on purpose’ and effectively. I was less than impressed when LinkedIn brought out its completely new look, feel and functionality right in the middle of the project. Nothing like having to run training on a piece of software which may or may not do what you think it will do when you are training clients! Putting my gripes aside, the new LinkedIn, in my opinion, is much better than the old LinkedIn. As I was doing the individual coaching calls I had the opportunity to play around with the new LinkedIn search. I discovered it may have lost some functionality, then regained some of it, and added some more functionality! 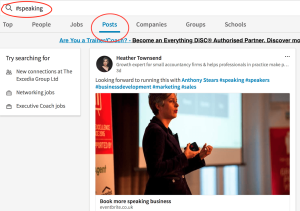 In this blog post I wanted to highlight the new LinkedIn search capabilities. Now I may have been wrong, but I don’t recall LinkedIn’s newsfeed being searchable. It has now become searchable, which is why you are seeing posts in the newsfeed pop up with hashtags in blue on them. To access the newsfeed you need to find the multipurpose search box. You then need to type in your search term. This can be with or without the hashtag. We found when playing around with search trying your keyword with and without hashtags, and also putting your search term of more than 1 word in “” really helped. You now have a rich stream of content to easily access from within LinkedIn without having to scroll down your newsfeed trying to find the diamond in a lot of rough. Being found in searches on LinkedIn will be another way of building your profile with the people who are interested in your stuff. This means when you put up a new post or share someone else’s post on LinkedIn think about adding some keywords with a hashtag.